The final words of a dying alien send the Doctor and Bernice to 30th-century Earth to attempt to avert a disaster. Arrested on the spot as prime suspects in the latest of a series of seemingly motiveless murders, they join Adjudicators Roslyn Forrester and Chris Cwej as they attempt to clear their name and uncover the truth behind a conspiracy that reaches far into the Doctor’s personal past. Even without the context of the other The New Adventures novels preceding it, ‘Original Sin’ is very much the beginning of a new era for the Seventh Doctor, and the two Adjudicators instantly step into the spotlight and unquestionably prove themselves to be worthy additions to the TARDIS by story’s end. Yasmin Bannerman expertly portrays the by-the-books and tough-as-nails Roz who is haunted by a memory she can’t quite remember and a questionable superior officer, and Travis Oliver perfectly brings to life the naïve but well-intentioned Chris who has a reckless streak and would even undergo a body-beppling procedure in the name of fashion. The two make an unlikely combination, but they instantly clicked in prose and here create a very sturdy foundation for a lasting relationship on audio as well. Aside from the characterization, the incredible world development on display- especially of Earth itself in this time period- creates a wonderful sense of detail and immersiveness from beginning to end. It’s quite telling that the Doctor compares the Earth Empire to the Daleks’, and the gastropod Hith members who have lost their world to Earth and taken on new names to reflect their current status- Homeless Forsaken Betrayed and Alone a highlight- are constant reminders of the pervasive oppression. The divided Earth comes to life vividly, and the threat of an unknown source of Icaron radiation driving genetically-susceptible and body-beppled humans insane is an effective threat within the confines of the story as the conspiracy grows. Andy Lane was somewhat unfairly criticised for incorporating too much unneeded continuity into his novel, but all of the references never intruded on the actual story itself. While audio adapter John Dorney has had to take out many of these moments, the occasional allusion to other tales still helps to give a strong sense of foundation and scope to this story. Of course, the story of the imprisoned and insane Professor Zebulon Pryce and his one-time research into Icaron particles on an experimental Hith craft that is now on Earth is gloriously kept intact, and the Doctor’s amazement at humans’ abilities to uncomfortably imprison others- this time on a planet orbiting the photosphere of a sun- still rings true. In fact, ‘Original Sin’ brings out a decidedly contemplative and ambiguous side to the Seventh Doctor when he meets Pryce, looking at who he is as a person and what type of life he lives and admitting that he simply hopes he is doing good and that he does, indeed, fear death. These are quietly powerful moments that transfer to audio quite well, another strong moment in a story full of strong characterization for the character who is in a very dark and morally-flexible place in his life at this time. The true villain of the piece, though, reaches far back into Doctor Who mythology, a surprising but welcome revelation that is thoroughly and expertly explained even if he inexplicably remains unnamed in the audio version. Tobias Vaughn has retained a lasting presence in fandom since his misguided attempts at dominion in ‘The invasion,’ and the amount he has achieved in a thousand years while keeping his consciousness alive and trying to catch the Doctor once again is profoundly staggering. It’s almost sad that he has dedicated such effort and time to catching the Doctor, having failed on several occasions before, but the ideas that his consciousness was initially transported to another shell in New York City after the Cybermen shot his first body and that he has since dubbed himself Earth’s champion while incorporating his mind into every INTEC robot currently on Earth and having been at least indirectly responsible for some of the Doctor’s previous adventures are realized very effectively, adding a significant and frightening menace to an always-ambitious man. 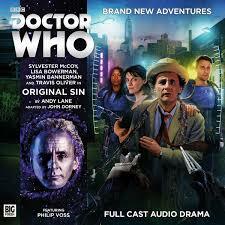 ‘Original Sin’ is a fantastic story, and it’s easy to see why Big Finish chose to adapt it aside from being able to formally introduce Bannerman as Roz and Oliver as Chris. With strong dialogue, a conspiratorial narrative that spans many worlds that are all brought to life wonderfully, and a truly riveting conclusion that showcases the shocking rise and fall of Vaughn, ‘Original Sin’ blends the old and the new incredibly effectively to send the Seventh Doctor in a brand new direction.